You Helped Me Choose My New Glasses. I have been wanting to get a new pair of glasses for ages. But honestly, who has the time to go to their local optician and spend hours trying to go through all of their models just to realize they don't have exactly what you are looking for? Me neither... So the 'try at home' service by Misterspex was a perfect fit for me. You can choose up to 4 glasses and get them send to you without them charging you anything. Then you have 10 days to try them on and send back. If you liked any of the models you can directly send them your prescription details and they will send your favorite model back to with your prescription. What a great service, right? Honestly, the hardest part is to choose the right one. So I went to my Instagram Stories and you helped me out. These were the ones that I ordered to try on. It was a pretty tough decision between the Ray-Ban model and the MK Ambrosine. Although I absolutely loved the Misterspex Aurel design, I think the model is better suited for people with lighter hair or darker skin tones at it almost blended in with my skin and wasn't opaque enough against my dark hair. Which is funny because I thought this one would suit me the most. So their 'try at home' service absolutely saved me from ordering new glasses that don't even suit me. In case you don't have the time to order a few pairs and send them back later, you can also 'try them on' on their website. For this, you simply need a webcam. Seriously, that is so much fun and totally helped me to narrow down which pairs I want to order. Also, I wanted to add how amazing the service was. The first 'try on' package was with me the next day and my prescription glasses only took around a week. Which is perfect for an impatient online shopper like me. So I bet you want to know which one I chose? After consulting Instagram, Twitter and my family I decided on the Michael Kors Ambrosine style. It's probably the most classic and flattering on my face. 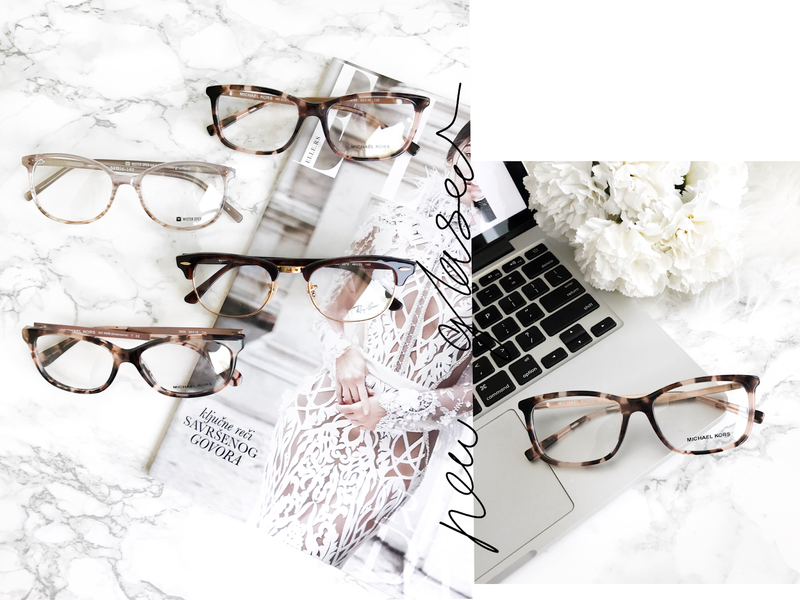 If you want to treat yourself to a new pair of (sun)glasses you can use my code 'lisaautumn15' for a sweet 15% discount. They are all nice but I'm glad you picked the Michael Kors as they were my favourite on you too! What a nice idea to let you try them all on at home before deciding! They are all really nice. I really nice the 2nd pair on you. It was seriously so hard to decide.. thanks lovely! They all look fab Lisa, love the tortoiseshell ones! You are so sweet Rubi, thank you! Every style suits you really well, but I definitely like the Michael Kors pair the most, they're so chic! So happy you like them too! All of the styles look amazing on you! But teh MK Ambrosine really is a timeless style. It would go with so many things! So happy I could inspire! What a great company! I love the concept! Definitely makes it so much easier to select a new pair of glasses! It's such an amazing concept, isn't it? so glad you like them as well lovely! i love the second one but you look pretty in them all ! I agree so much lovely! Amazing concept! Your blog is so beautiful! I love the soft colors and layout :) Just wanted to tell you! And of course - love those glasses! Oh you are the sweetest! THANK YOU! Thank you for reminding me to get my prescription checked again! Honestly, you look amazing with all those frames, but my personal favourites are the ultra cool Ray-Bans! Love them! YAY honestly I loved them all so much so it was so hard to decide.. So glad you like them too lovely! You look so cute with those glasses dear. Love the frame, it's really chic and classic. Ahh Jessica you are always so sweet! Thank you! These were the best ones for you. You chose well. Love them all!! But MK is my favorite! So glad you like it aswell! The glasses look great on you. It sounds like a great option when shopping for a pair. So happy you like them Cris! So many lovely pairs of glasses here. I love getting a new pair of glasses, it is like getting a new look! Girl same! It's like getting a haircut! Great glasses really make a statement. Such pretty glasses! LOVE them, so stylish ! So glad you like them Olivia!